Today was the day a grandma dreams about; from the very first time they find out they are going to be a grandma! At least this one did!! Today my grandson said “Gramma!” Oh what a day we were going to have!! He smiled at me when he said it and made my heart swell. Auggie knows who I am! It is a simple thing, I know, but this little person looked at me and said “Gramma!” Then he took off running! I was so excited, can you tell? After we gathered up all the “Auggie equipment,” off we went to the Farmer’s Market. There is always so much to see there and the cheese tasties are so yummy! We found what we needed and got ready to go. While we were walking to the car, Auggie grabbed my hand and away we walked. There was something so wonderful when those little fingers grabbed my hand and took me for a walk. He was jabbering while we were walking. He looked up at me and I said, “Yes, of course!” That was all he needed to hear and away we went! It was heaven! 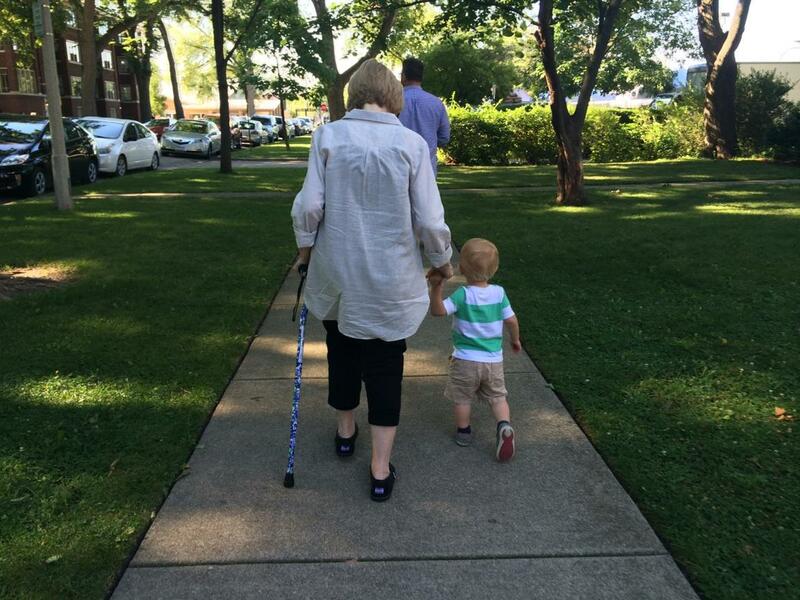 I can say I went walking with my grandson, what a amazing feeling. When we got home, he wanted to play with my cane. He can say “cane” quite well! I learned that when I am not around, he uses his mom’s umbrella for his cane! We went out to lunch and while sitting outside at the restaurant, we colored. He gave me the crayon he wanted me to use. It was blue! What fun we had! I forgot how much I love to color! It was a wonderful day with my little Auggie. An August day for sure! This entry was posted in Being a Grandma and tagged family, grand-parenting, grandson, love, sue erdmann, tea and milkbones by soozerdmann. Bookmark the permalink.